The image above is scanned from an old stereoview, published by B. W. Kilburn, Littleton, 1896. 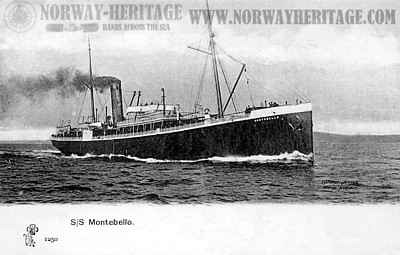 It is showing the Wilson Line steamship Montebello at the Bjørvika Pier in Christiania. The large buildings in the background are part of the railway station "Østbanen". In the background at the right we can see smoke raising from where the platforms for the trains were located. 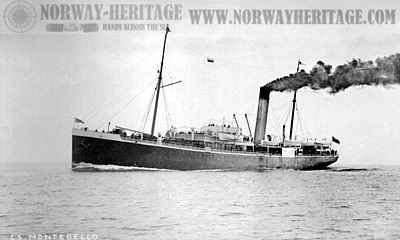 In the surrounding areas the agents of the great transatlantic steamship lines had their offices, and the emigrants were met by the agents as they arrived Christiania by train. The pier from where the emigrants departed on the Wilson Line ships on their way to Hull, is at the same place as where "Scandinavan Star" departed from in 1990, on her last voyage before the terrible fire in which 158 lifes were lost. 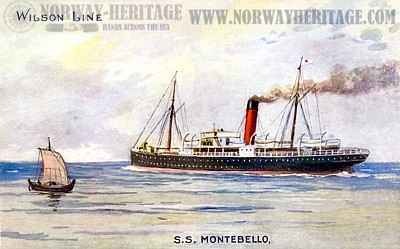 The new opera which is being built in Oslo, will be located just to the right from where the Montebello is moored, and the new Hotel Opera just where the smoke is coming up fro the train.